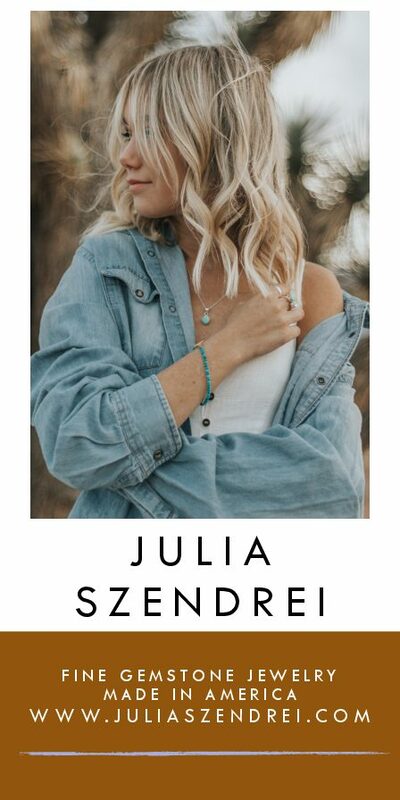 The iconic Jackson Hole Aerial Tram rises 4,139 feet to the top of Rendezvous Mountain, and the owners of this Shooting Star residence can watch its journey every day. 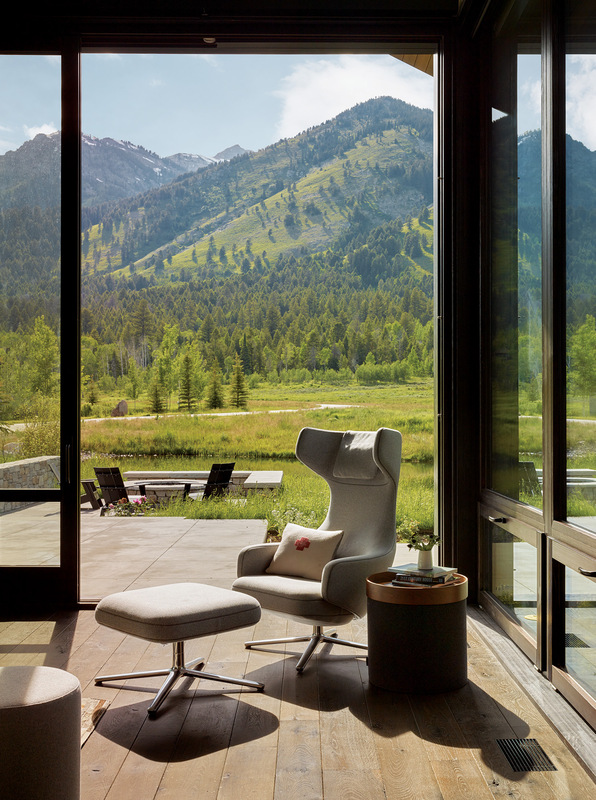 Their unique mountain home, located just yards from the fabled Jackson Hole Mountain Resort in Teton Village, Wyoming, blends the art of mountain living with the owners’ Swedish heritage to create a space that is a singular mix of mountain sensibility and Scandinavian style. Located in the Shooting Star community, the house is home to a family of four (including two young children), who took a winding path to make the mountains their home. Originally from Sweden, they were living in New York City when they decided to build a vacation home in Jackson. They soon fell in love with the mountains and decided to make the home their primary residence, moving in January 2015. The house is 6,200 square feet, and includes an 800 square-foot garage and mechanical room. 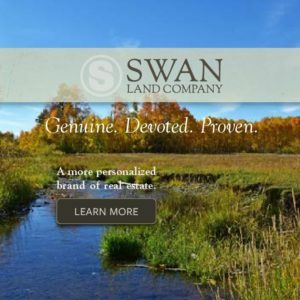 It sits on 1.5 acres with prime outdoor space, including a hot tub, fire pit, picnic table, garden, treed courtyard and plenty of lawn for the kids to play on. There’s even a pond with fish. “It’s designed for a growing family,” says Jennifer Mei, architect and interior designer with Carney Logan Burke Architects in Jackson. Building in the Shooting Star subdivision provided the opportunity to create a rustic, mountain exterior that features a clean-lined, contemporary interior with a palette and materials reflecting the family’s Swedish heritage. Mei notes that the owners preferred a simple array of materials such as the rustic, dark oak flooring and reclaimed corral board that was used for exterior siding and interior accents. They complemented these touches with a more refined, smooth, white Danby marble and rift-sawn white oak cabinetry to add a light, airy feel inside. 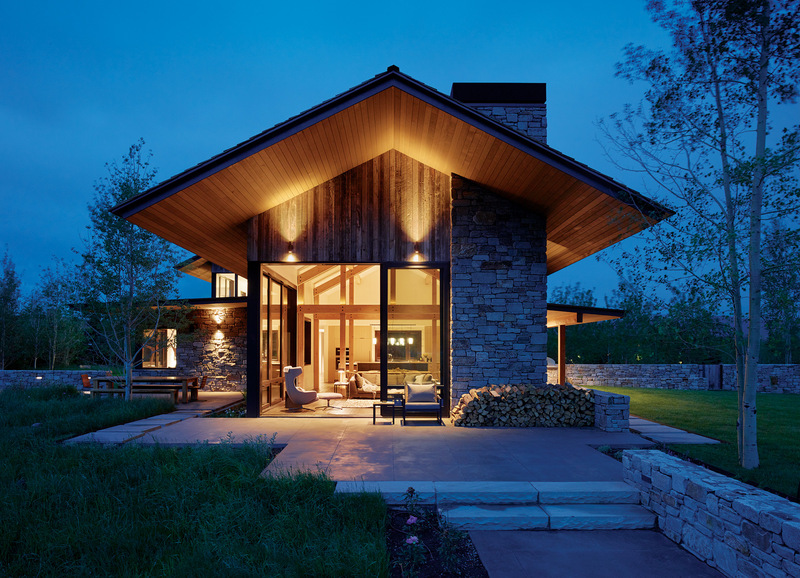 Reclaimed barnwood and natural stone with gabled roofs make up the exterior, creating a cool, neutral palette that follows the subdivision’s prescriptive guidelines for building. The eaves are cantilevered and work to provide protection from weather while allowing stunning, unobstructed views. Some of the best views in the house are from the living room, where 12-foot wide and 14-foot high lift-and-slide doors open to the mountainside, creating an indoor-outdoor experience. These enormous windows provide views to the top of Rendezvous Mountain where the tram summits. The original plans didn’t allow for mountaintop views from the living room, but were revised to incorporate them. Along with stunning views, the living room includes a fireplace made from Chief Cliff gray stone from Montana, tumbled to soften the edges. This same stone is used in the home’s exterior, one of many elements of continuity throughout the house. 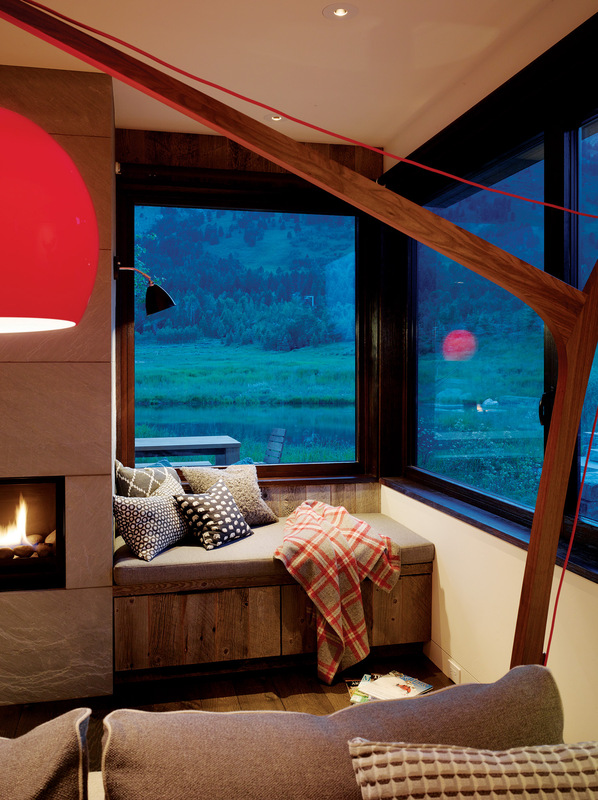 The fireplace features an open, corner-pivoting door designed by Bozeman-based Brandner Design. Another element of continuity is the Oslo gray stone used outside as a paving stone and inside in the gas fireplaces in both the den and master bedroom. 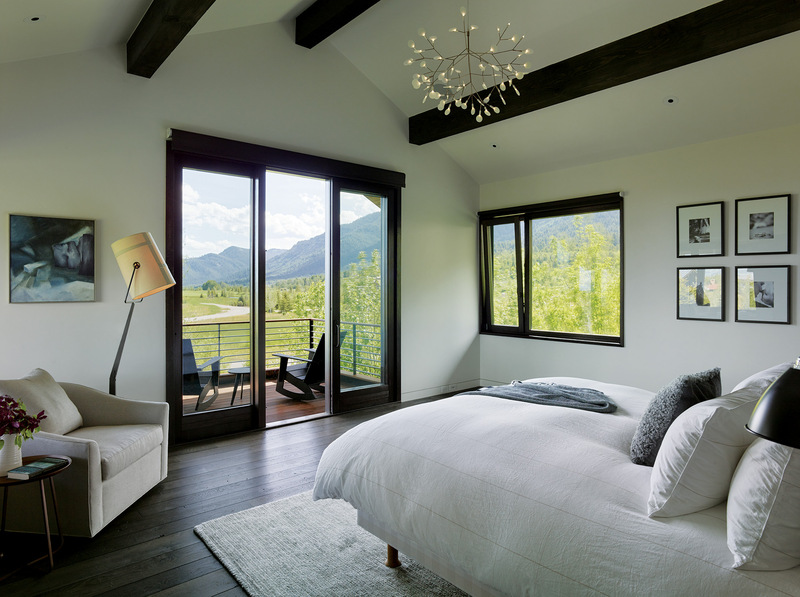 The master bedroom boasts a sunny deck and an abundance of natural light, with a bathroom that includes marble tile and flamed finish basalt stone floors and counters, as well as a deep soaking tub. Down the hall, the children’s bedrooms feature local touches such as bear and elk-clad wallpaper. Oak slabs with natural unmilled edges sourced from the Midwest create the kids’ desks. These slabs are also used in the downstairs mudroom where they serve as benches amid cubbies for helmets and goggles, and hooks for coats and ski gear. Across from the mudroom is a fun bunkroom, which adds a playful element. Next to the bunkroom is a guest room with an en suite bath, stunning views and a built-in wardrobe by Falls Cabinet and Millwork, complete with leather pull handles. Furnishings throughout the home mark steps along the family’s journey from Sweden to New York to Jackson. A long dining table and chairs were sourced from Sweden while a coffee table was created by Brooklyn-based Uhuru furniture studio. Wishbone chairs surround the kitchen table and a Vitra chair provides opportunities to relax in the living room. Rugs from Restoration Hardware and other sources add an element of warmth. The art in the home further emphasizes the family’s sojourn to Jackson. In the den, paintings of a bear and a buck from the RARE Gallery add local flavor. Peter Lik’s artwork incorporates a taste of the family’s homes past and present, with a depiction of New York’s Central Park as well as a local winter landscape entitled, Winter Calm. These fine touches combine elements of the family’s Scandinavian heritage with their New York history and the new roots they’re now planting in Jackson Hole. 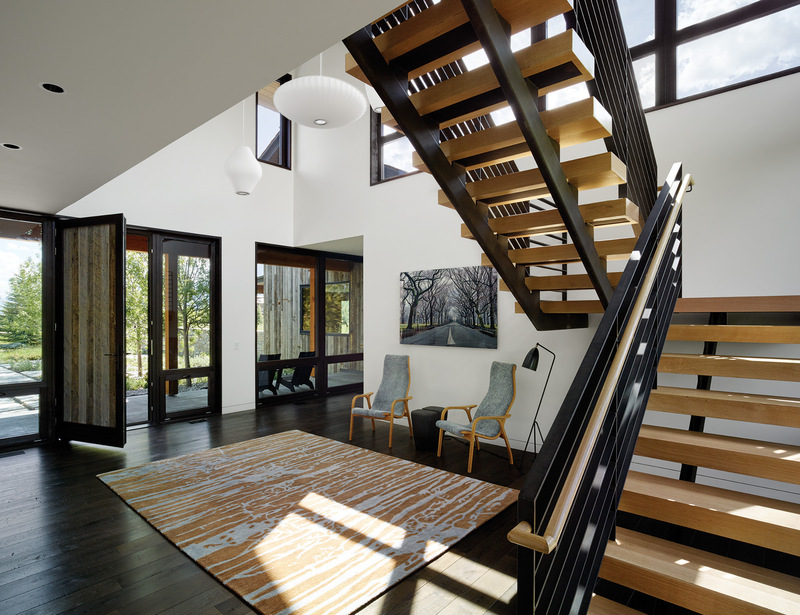 A central staircase with open risers and streamlined design creates a sculptural element in the entryway. Sleek, simple lines define the home’s kitchen. An expansive 12-foot wide and 14-foot high lift and slide door opens up the inside of the home and provides an element of indoor-outdoor living. The master bedroom opens up to a sunny deck perfect for relaxing. 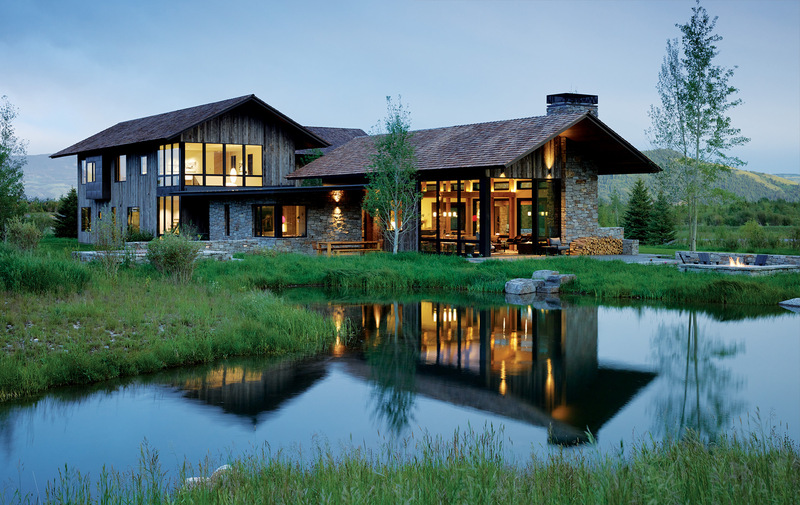 A pond outside provides an element of country living within a stone’s throw of Jackson Hole Mountain Resort. Expansive windows allow views of stunning scenery while providing a natural gathering place for the family. Reclaimed barnwood, sleek and classic seating options, and fantastic scenery combine to create an attractive and functional breakfast nook. 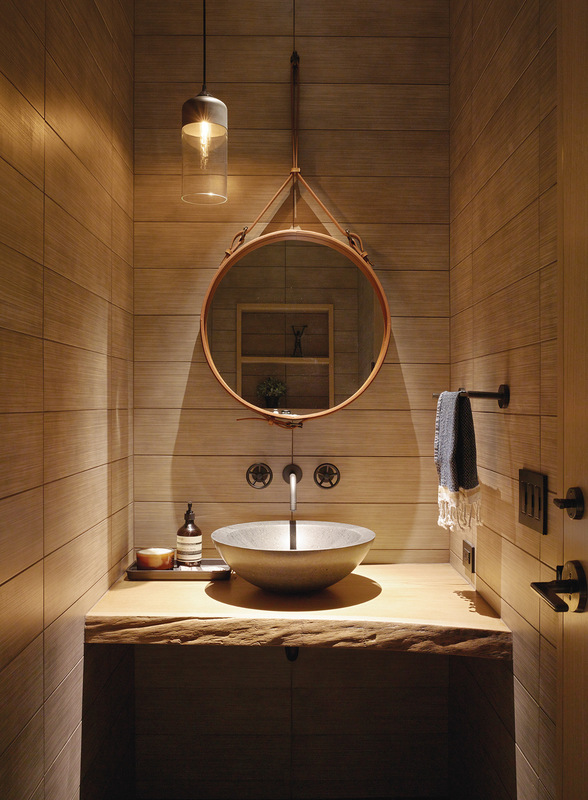 Scandinavian simplicity and mountain living combine in this functional and attractive bath.